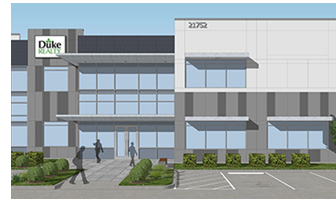 ​​​ HOUSTON – Duke Realty will develop Clay 99 Building 5, a 433,200-sf industrial project on 23.7 acres off the Grand Parkway. The building at the intersection of Clay and Peek Roads will include 36-ft clear heights, 190-ft truck courts, 347 automobile parking spaces, and 100 trailer parking spaces. Delivery is set for February 2020.